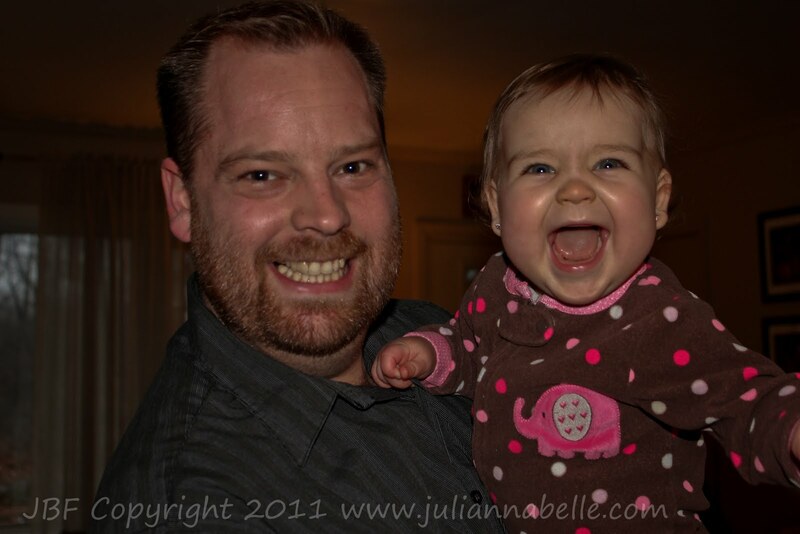 Julianna is almost 11 months old and up until now, we kinda figured she would never get any teeth. 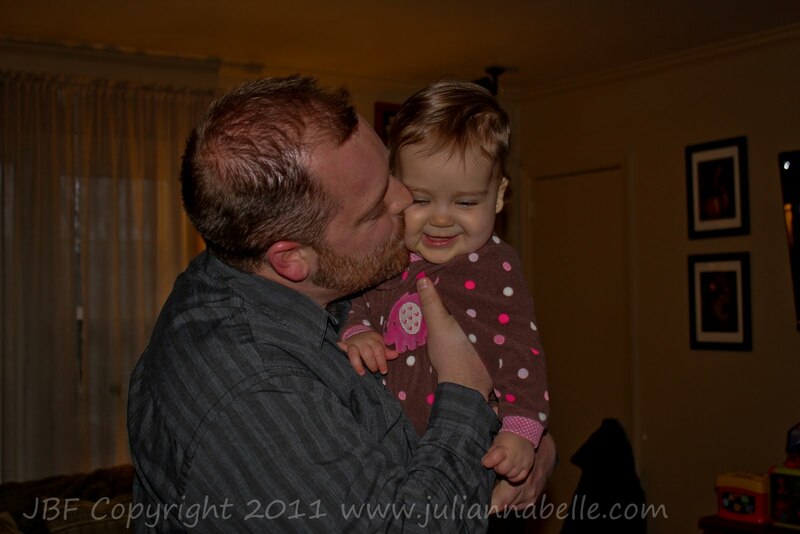 This poor little baby girl of mine... she is now making up for lost time. Her first tooth came in on Sunday morning. Hooray. Daddy and I were so happy! THEN...Her second tooth came in on Monday (yes the next day) morning! The doctor pointed it out on Monday. What? A second tooth so soon? The doctor also pointed out that her 4 top teeth were all coming in - you could see them through her skin and trying to poke through. They look so completely painful. Then, Wednesday morning, low & behold - a 3rd tooth started pushing it's way through the skin up top - one of her eye teeth! OK just in case you aren't keeping track - that is 3 teeth in 4 days. This poor little girl. She has been pretty miserable as you can imagine. All of this on top of a cold (virus) and baby asthma. She is not feeling good at all. Her chest is so congested - I feel so bad for her! I just want to make it all better for my little sweet girl. She's a trooper though. She's still been sleeping through the night - thank goodness!! However, she does not have much of an appetite. Who can blame her though?! The only thing that is working for her teeth is baby acetaminophen. She wants nothing to do with the frozen washcloth, teething rings or any toy that could be for teething. She will chomp on the Binky... and her hand. I went and got Humphrey's teething tablets for her since everyone swears by them. I guess I was silly to think it could be as easy as putting a tablet in her mouth. Nope. You have to dissolve 1-3 of them in 1/2 tsp water and then rub them on her gums. YEH RIGHT - good luck trying to get a finger NEAR her mouth. She thrashes & flails and freaks out b/c she doesn’t want you anywhere near her gums or teethies. I then put the Humphrey's liquid in a dropper and we had to almost sit on her to get it in her mouth. Very unpleasant for all parties involved as you can imagine. ...And now as I sit here writing this, Daddy is being very pathetic saying he needs something to help him feel better. He is getting sick now too. I can see this is going to be a fun weekend taking care of my 2 babies. I just want my baby happy & back to her normal self again... my heart is breaking for her. Here's some pictures of Jules on Friday night with Daddy. She was happy & toothless here. I'm starting to think being toothless wasn't so terrible. I hope she feels better soon :( Sick babies are so sad and helpless. I know this sounds terrible but Jacob just started getting his molars and we used baby ambesol- of course against his will. He also doesnt want anything cold in his mouth either so we figured we would try the baby ambesol. First we gave him baby tylenol. About 15 minutes later Chris held him and held his hands down and I put on the baby ambesol as he cried and screamed loudly. When I was done he was very upset but then after about ten minutes he was alot happier. Good thing they never remember things like this. aw teeth! YAY! I hope she feels better soon. :) By the way I love reading your blog! Amanda - thanks, I think we have turned the corner today... she is better finally! Ugh I feel your pain, Mia got 4 teeth last week. The good news is that when they come in bursts you get a nice break between them.